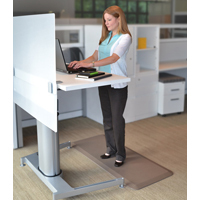 The Back App 360 Balance Board provides an innovative means of reducing the potential for standing fatigue by facilitating movement at a standing office workstation. When a user steps onto the board, the unique design forces them to balance their body, resulting in 360° of controlled rocking movements. The desired degree of movement can be adjusted by turning the red knob on the underside of the unit, and is always a smooth controlled movement due to the rubber damping ring on the underside of the unit. This balance training activity can greatly reduce soreness and fatigue in the legs, ankles and feet arising from standing in a stationary position. The balancing process actively targets affected areas including the foot and leg muscles while naturally facilitating blood flow and nerve circulation. Usage of the Back App 360 stimulates movement in the knee and hip joints and also helps prevent muscle atrophy and inflammation. For beginners it is recommended to ensure that the red knob is positioned at its lowest setting by twisting it clockwise for stability, then gradually turning it to extend it outwards until the desired level of movement is achieved. For users that prefer variation in their workstation throughout the day, even temporary usage of the 360 Balance Board will achieve this goal. For some users, the easily accessible and configurable movement can be enjoyable, improving their morale and allowing them to be more productive. The 360 Board platform is 20" wide by 14.2" deep, large enough for most adults to stand on it comfortably. It is composed of recyclable thermo plastics, and comes in Dark Grey and Light Grey colors. The GelPro Elite Anti-Fatigue Mats by Lets Gel provide a superior cushioning for those who choose to work without footwear. The 0.75" thick patented Dual Comfort Core combines a top layer of soothing gel with the support of a bottom layer of energy-return foam. The gel "flows", gently conforming to the contours of the feet, making the GelPro Elite Anti-Fatigue mats especially well-suited for those who are working without footwear. The lower layer of energy return foam provides additional cushioning and acts as a shock-absorber for impacts greater than what the gel can absorb on its own. This combination of materials creates a product with excellent anti-fatigue properties, able to significantly reduce joint stress, fatigue, and discomfort from standing. 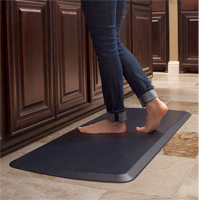 This makes the GelPro Elite Mats a good choice for those experiencing a wide range of back, leg, or foot related discomfort. The GelPro mats feature beveled and non-curling reinforced contoured edges with softly rounded corners, eliminating potential tripping hazards. The underside is a certified non-slip material which further enhances the safety. 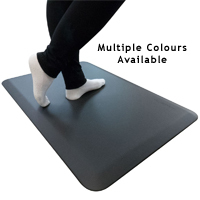 Unlike many other anti-fatigue mats, the surfaces of the GelPro Elite Anti-Fatigue Mats are textured for additional comfort, providing a surface with greater breathability than most and are available in multiple textures and colours. The textured and coloured surfaces combine to create an anti-fatigue mat with aesthetics which make it as suitable at home as it is in the office. Note: Footwear eliminates the natural contours of the feet, presenting a uniform flat surface to the mat. This prevents the gel from "flowing" to match the natural shape of the feet. The result is that users in footwear may find that the gel layer feels "squishy" and creates a floating effect which they may not appreciate. 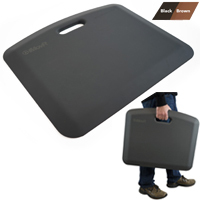 Those who intend to use their mat primarily when wearing footwear might want to consider the MATAR Anti-Fatigue Mats as a more suitable option. Les GelPro Elite Anti-Fatigue Mats par Lets Gel offrent du matériaux de rembourrage beaucoup plus élevé pour les utilisateurs qui veulent travailler sans souliers. Le tapis breveté de 0.75po offre un Dual Comfort Core épais qui contient une couche du dessus fait en gel apaisant avec le support du couche en dessous fait en mousse qui égalise l`énergie. 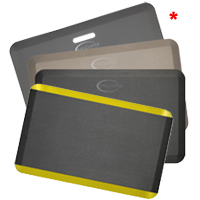 Le gel circule, et s`adapt légèrement aux contours des pieds, ce qui fait les GelPro Elite Anti-Fatigue Mats appropriée pour les utilisateurs qui veulent travailler sans souliers. La couche en dessous fait en mousse qui égalise l`énergie offre du rembourrage supplémentaire et agit comme un amortisseur de choc pour les impacts plus grande que ce que le gel peut absorber tout seul. Cette combinaison de matériaux crée un produit avec excellente qualités anti-fatigue, capable de réduire considérablement la pression sur les jointures, la fatigue et la malaise d`être debout. Cela fait les GelPro Elite Mats un bon choix pour les utilisateurs qui ont des douleurs ou malaises à grande variétés dans le dos, les jambe, ou les pieds. Les GelPro mats ont des bords en biseau et non-courber renforcé, aussi que des coins doucement arrondis, qui réduisent le risque de trébuchement. Le dessous est fait avec du matériaux certifier d`être de haut traction et non glissantes qui améliore la sécuriter. 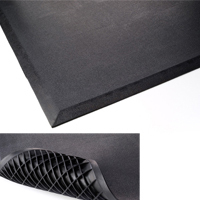 Contrairement à plusieurs autre tapis "anti-fatigue", la surface des GelPro Elite Anti-Fatigue Mats sont texturés pour le confort supplémentaire, ce qui offre une meilleur surface respirable que plusieurs autre tapis, disponible en plusieurs différentes textures aussi que couleurs. La texture aussi que la surface colorée réunissent ensemble pour faire un tapis "anti-fatigue" qui est belle, ce qui le fait une bonne solution à la maison aussi que pour le bureau. Veuillez noter: Les souliers élimine les contours naturel des pieds, qui pose une surface plat constant sur le tapis. Cela empêche le gel de circuler pour correspondre aux contours naturel des pieds. Le résultat est que l`utilisateur va peut-être trouver que la couche en gel à une sensation moelleux et un effet flottant que l`utilisateur va peut-être pas apprécier. Les utilisateurs qui préfèrent travailler principalement avec les souliers sur les pieds vont peut-être trouver que le NewLife Eco-Pro Anti-Fatigue Mats est un alternative supérieur. 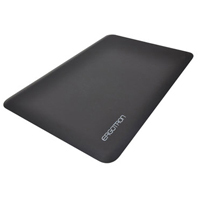 The WorkFit Floor Mat from Ergotron offers users a highly-cushioned standing surface ideal for use at sit-stand or standing workstations. The mat combines a medium density polyurethane core with a high tear strength outer membrane which is firmer to the touch than the surface of some similar mats. 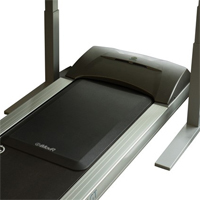 The result is a mat with good cushioning abilities as well as a long-wearing surface. In addition, wide beveled edges reduce the potential for a tripping hazard. 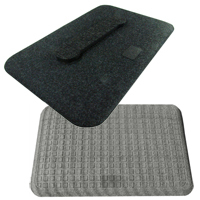 The Ergo Comfort Mat from ErgoDesktop is a general use rubber mat for a wide range of working environments. 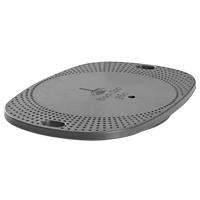 The beveled edges help reduce slipping and tripping hazards, while making the mat accessible for wheeled carts, etc. The waffled underside gives the Ergo Comfort Mat a softer, more flexible anti-fatigue structure, so that feet can escape the tiring effects of standing on hard surfaces for long periods of time.